So many readers have submitted questions to the Road Warrior that it’s time to simply catch up. I enjoy reading your emails and helping to navigate a resolution for your problems, from fixing potholes and faulty traffic signals to finding out whether some of these roads will be extended. Please keep those questions rolling in. 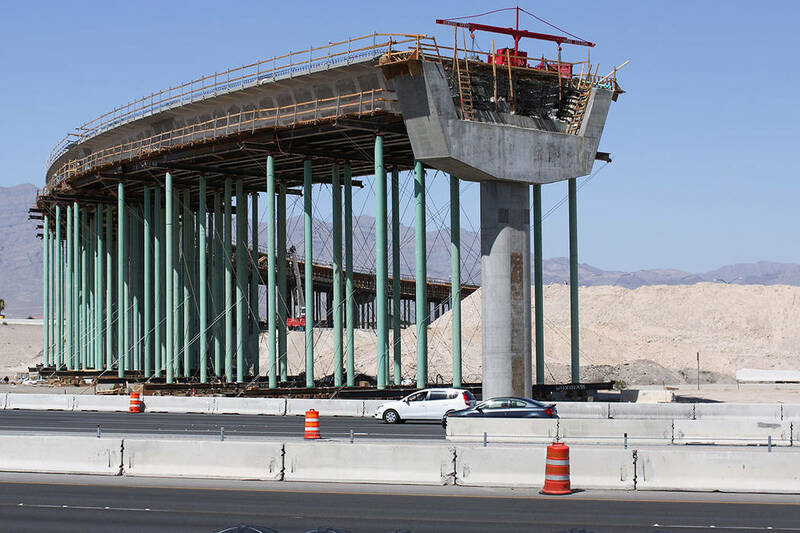 Construction continues to move along on a 60-foot-tall flyover bridge linking the westbound 215 Beltway to southbound U.S. Highway 95 as part of a $47 million project at the Centennial Bowl freeway interchange in northwest Las Vegas. James from Las Vegas wanted to know why the Nevada Department of Transportation opted to build a costly bridge, rather than a short, ground-level ramp that would be far less expensive. It all comes down to keeping traffic moving at what’s expected to become the second-busiest freeway interchange after the Interstate 15-U.S. 95 interchange known as the Spaghetti Bowl, NDOT spokesman Tony Illia said. “A ramp is no substitute for a flyover bridge, built and designed to state and federal standards with an anticipated lifespan of 50 to 75 years,” Illia said. A ramp created stop-and-go traffic, resulting in backups onto the freeway, Illia said. In comparison, flyover bridges allow drivers to make a direct connection while still maintaining freeway speeds. The flyover should be completed and ready for use in August. Dave from Las Vegas said he has a beef with some timing and sequencing adjustments that were made in February at Windmill Lane and the 215 Beltway in the southwest end of the valley. In particular, Dave doesn’t like that the adjustments favor traffic coming off the Beltway. It turns out these changes are the domino effect caused by the temporary closure of the nearby Warm Springs Road exit from the Beltway — which should reopen by June. Warm Springs is closed because crews are building a $52.5 million flyover bridge linking the southbound Airport Connector to the eastbound Beltway. As a result, drivers are being detoured to the Windmill exit. The new signal sequence favors vehicles coming off the Beltway as a way to prevent major backups on the ramp and highway, said Angela Castro, a spokeswoman for the Regional Transportation Commission of Southern Nevada. Unfortunately, that means more traffic on Windmill. “We understand the frustration this may cause, but the decision was made in the interest of safety for all drivers,” Castro said. Clark County spokesman Dan Kulin said the signal timing was recently adjusted in response to your complaint, Dave. Ronald from Las Vegas wanted to know whether a traffic signal was planned for South Town Center Drive and West Tropicana Avenue. Likewise, Bill said he would like to see a signal installed at Russell and Lindell roads. “Not at this time,” Kulin said of both requests. We could all use some green time on the road, but not all traffic signals are synchronized with one another, as Roy from North Las Vegas found out. Roy wanted to know whether the signal timing on Fifth Street, between Cheyenne Avenue and Las Vegas Boulevard, could be adjusted. “At night, it is really annoying waiting for the light to cycle, then you drive a couple hundred feet where the next light gets you,” Roy wrote in an email to the Road Warrior. That two-mile stretch of Fifth Street crosses with some pretty major streets, including Carey Avenue and Lake Mead Boulevard. The city can’t coordinate the signal at Fifth and Carey due to a lack of fiber connectivity, North Las Vegas city spokeswoman Delen Goldberg said. And the good news is that the signal at Fifth and Lake Mead is synchronized. The bad news is that it’s coordinated with other signals along Lake Mead and doesn’t favor Fifth. Kevin from Henderson noticed that the pavement was particularly rough on Stephanie Avenue, between the 215 Beltway and Horizon Ridge Parkway, and wanted to know whether there were any plans for repairs. Henderson city officials are aware of the problem but don’t plan to make repairs until 2020. With the approval of the county’s Question 5 last November to extend the fuel indexing tax, the project should be completed in another year or two, Henderson city spokeswoman Kim Becker said. — Northbound U.S. Highway 95 will be reduced to one lane between Craig Road and the 215 Beltway from 9 p.m. Sunday to 5 a.m. Friday. Crews are working on a new flyover bridge. — Southbound U.S. Highway 95 will be reduced to one lane between Durango Drive and the 215 Beltway from 9 p.m. Sunday to 5 a.m. Friday. Crews are working on a new flyover bridge. — Nellis Boulevard will be restricted between Alto and Cheyenne avenues from 9 p.m. to 5 a.m. weekdays through April 21. Crews are completing sewer work. — Cecile Avenue will be restricted between Lamont Street and Nellis Boulevard until April 21. Crews are completing sewer work. — The Rampart Boulevard on-ramp to westbound Summerlin Parkway will be closed until April 22. Crews are widening the ramp. — Lone Mountain Road is restricted between Cliff Shadows Parkway and the 215 Beltway until April 22. Crews are working on an overpass. — Southbound Durango Drive will be restricted between Wigwam Avenue and Blue Diamond Road from 7 a.m. to 5 p.m. weekdays through April 28. Crews are doing sewer work. — Rainbow Boulevard will be restricted in each direction between Hacienda Avenue and Sunset Road from 9 p.m. to 5 a.m. until mid-June. Crews are repaving the road and adding a traffic lane. — The Warm Springs Road exit from the eastbound 215 Beltway will be closed through June. Crews are building a new bridge over the highway. — The northbound U.S. Highway 95 exit ramp to Rancho Drive will be closed from Thursday to June 21 for work associated with Project Neon. — Northbound U.S. Highway 95 will be reduced to one lane between Craig Road and the Beltway from 8:30 p.m. to 5 a.m. weekdays through June. Crews are working on the Centennial Bowl ramps. — Southbound U.S. Highway 95 will be reduced to one lane between Durango Drive and Ann Road from 8:30 p.m. to 5 a.m. weekdays through June. Crews are working on the Centennial Bowl ramps. — Martin Luther King Boulevard is closed between Oakey Boulevard and Interstate 15 through July. Crews are installing drainage boxes. — Oakey Boulevard is closed between Main and Commerce streets through July. Crews are installing underground utilities and storm drain infrastructure. — Summerlin Parkway’s westbound lanes will be restricted between Buffalo Drive and Rampart Boulevard through July. Crews are building a new auxiliary lane and making other improvements. — The 13-mile scenic route at Red Rock Canyon National Conservation Area will be repaved in one-mile increments through the summer. — U.S. Highway 95 will be restricted between Rancho Drive and just east of Interstate 15 through January 2018. Crews are building a new flyover ramp for high-occupancy vehicles as part of Project Neon. The average gasoline price Friday in the Las Vegas Valley was $2.63 per gallon. It was $2.66 in Nevada. The national average of $2.39 is up 7 cents from a week ago, up 9 cents from a month ago and up 35 cents from a year ago.